Bill Hawkins is an experienced trial lawyer in complex commercial, construction and employment litigation and provides general business advice for multinational corporations in corporate governance. He resolves complex matters with the long-term business goals of his clients in mind and is innovative in his development and application of solutions. Bill performs alternative dispute resolution for clients and third parties, working as an arbitrator and mediator to resolve disputes outside of the courtroom when appropriate. Clients hire Bill because his experience has given him an understanding of his clients’ industries and business objectives. Bill is listed in The Best Lawyers in America© and is designated a Distinguished Neutral by the International Institute for Conflict Prevention & Resolution (CPR Institute). Represented multinational company in a significant contract dispute arising out of an alleged wrongful termination of an employee who was fired after theft of equipment and trade secrets. 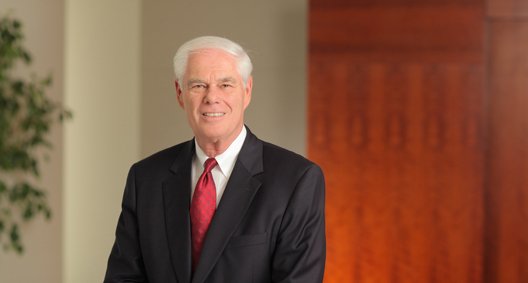 Bill's thoughtful mediation between his client and the terminated employee allowed the dispute to be resolved favorably for his client without litigation. Acted as lead trial counsel in a series of toxic exposure actions on behalf of a government contractor involved in the nuclear weapons defense program. Bill secured jury trial victories in state and federal court by demonstrating his thorough understanding of the complex science at issue in these cases and the manufacturing procedures utilized by the client. Acted as trial attorney on complex commercial construction matter. After jury was seated and opening statements presented, Bill moved for a directed verdict. The directed verdict was granted, and as a result, the client's counterclaim was resolved shortly thereafter on very favorable terms. Advised client on corporate governance policies, practices and procedures pre- and post-initial public offering. Bill worked closely with client's in-house legal, financial, and human resources teams to prepare for IPO and continued to support compliance and finance executives and general counsel post-IPO. Advised company in multinational contract negotiations involving sophisticated technology and support. Bill's detailed knowledge of client's business and technology allowed him to work seamlessly with client and its in-house negotiating team. Represented, along with litigation team, a federally insured bank in five parallel, putative, nationwide class action lawsuits initially filed in federal courts, now consolidated in single action. Complaint challenges a consumer product offered by the bank and seeks to shut down this line of business. Lawsuit raises unique and complicated issues of first impression in a highly regulated area. District court granted a motion to dismiss on virtually all claims. Best Lawyers® 2018 "Lawyer of the Year"